Worbital is a real-time strategic artillery game by Team Jolly Roger, peppered with a heavy dose of cosmic chaos. Your goal is to be the last civilization standing. With the shifting gravity on your side, aim your cannons, blast your enemies and enjoy the fireworks. Worbital is space war in real-time with tension-filled gameplay and gravitational destruction. Each player commandeers a planet, building support structures and increasingly powerful weapons. Use your weaponry to destroy enemy planets and wreak total havoc to the solar system. Engage in real-time planet-to-planet cannonade in a shifting solar system, with the gravity as your ally or enemy. Plan your loadout, build and upgrade weapons ranging from simple railguns to planet-derailing World Rammers. Aim and fire your artillery through space to chip away at enemies’ planet surface, reveal their core and blow it up. 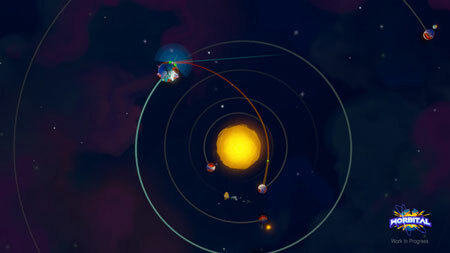 Wage orbital war against AI or challenge your friends in Online and Local Multiplayer. Survive as chunks of exploding planets, asteroids and other celestial objects threaten your planet, with explosive chain reactions eventually destroying the sun itself. If you get stuck in the game, check out the video walkthrough and gameplay for the game. This entry was posted in PC Games, Walkthrough and tagged Worbital Cheats, Worbital Game, Worbital Gameplay, Worbital Guide, Worbital Hints, Worbital Review, Worbital Solutions, Worbital Strategy, Worbital Tips, Worbital Walkthrough by Marvin. Bookmark the permalink.